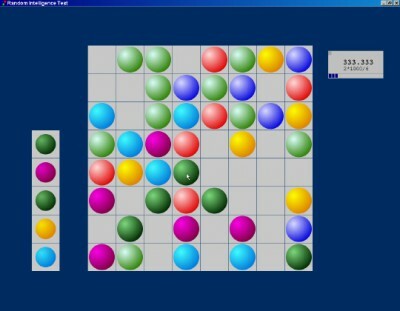 Random Intelligence Test 1.2 is science software developed by Oleg M. Goryunov. Free random intelligence test based on Color Lines game. There are complexity adjustment by number of colors and initial balls, precision setting, saving results through Internet and settings in the registry. It calculates average appraisal of intellect, i.e. arithmetic mean of total scores gotten in every round of test. With lesser complexity the test can be used for intellect development. This science software is freeware, which means you can download and use Random Intelligence Test 1.2 absolutely free. There's no need to buy the product. Random Intelligence Test 1.2 supports different languages (including English). It works with Windows 98/XP/Vista. Latest Random Intelligence Test 1.2 does not contain any spyware and/or advertise modules, allowing installing it with no worries concerning valuable information loss. Our website has thoroughly tested education product Random Intelligence Test 1.2, written the review and uploaded installation file (51K) to our fast server. Downloading Random Intelligence Test 1.2 will take several seconds if you use fast ADSL connection. Very accurate quiz based on color selections. Tests your psychological state.